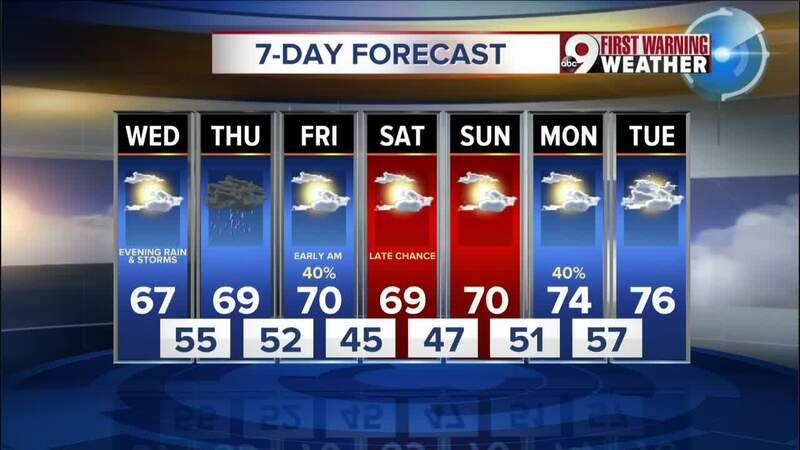 The latest weather forecast from WCPO's 9 First Warning Weather team. Clouds will break this morning and we could see isolated showers well south of the Ohio River. Otherwise, looking at a mixture of sun and clouds today with seasonal highs in the upper 60s to near 70 degrees. A warm front south of the Tri-State will lift northward later this evening. Showers and storms will develop this evening into the overnight. We start Thursday wet but rain is forecast to clear out during the late afternoon. A cold front approaches from the west late Thursday and keeps a small chance of rain in the forecast late Thursday night into early Friday. Much of Friday though will be dry and partly cloudy with highs near 70. The weekend looks decent. While there is a chance of showers late Saturday, we should be dry for Sunday with highs in the lower 70s. If you don't already have our Storm Shield app, you can download it here .